The EZ fold stroll ‘N trike deluxe is the ultimate grow-with-me trike that offers the convenience of a quick easy fold so you can store or take it anywhere. There are 4 ways to ride: Infant trike, push trike, learn-to-ride-trike, and classic trike. It also provides essential safety features for the youngest riders, including removable wrap around tray with cup holder, a footrest, and a 3-point harness. Remove the height-adjustable push-handle & canopy with tinted viewing window, and your child is ready to ride on their own. Designed with a parent pouch with bottle holder, a seat pad and a handlebar cover for added enjoyment. Quick, compact fold in one easy step. 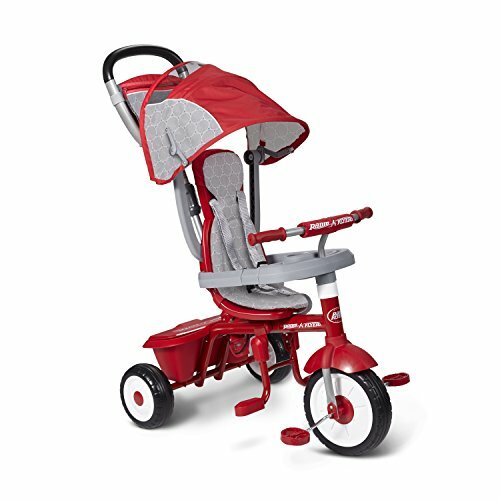 Grows with your child - Infant trike, steering trike, learn-to-ride trike, and classic trike. Parent pouch with zipper and bottle holder. Removable canopy with tinted window and safety tray with cup holder that rotates open for easy child entry.